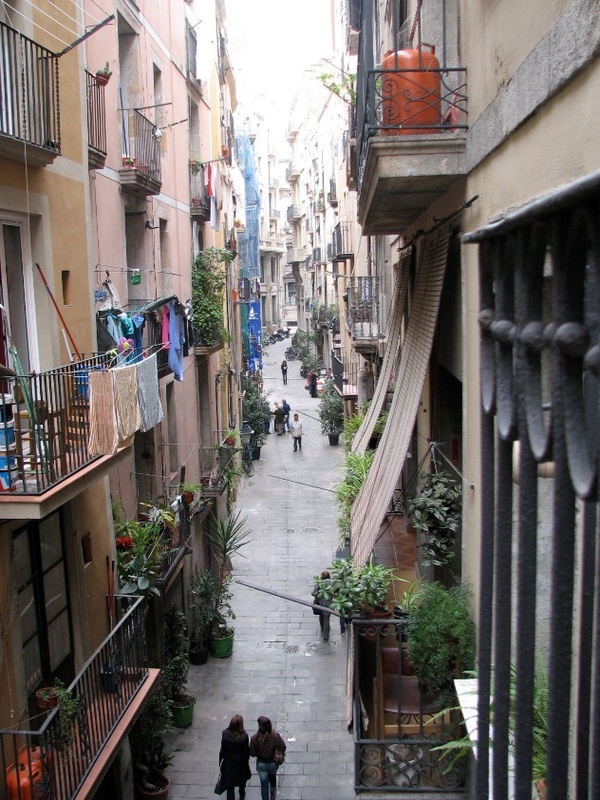 Who hasn’t wanted to go to Barcelona and get lost for a few days in the Catalan capital? Who wouldn’t want to come and settle in this sun-drenched region, where the beauty of life mixed with postcard landscapes give you the feeling of being in paradise? Well, as a student living in Barcelona, I will give you a few great tips to get the most out of this beautiful city. But I warn you, I am not going to tell you the basic tourist attractions to visit, plenty of websites or books can do that for you. I will tell you what I really like about this city, and what I strongly recommend for you to do! La Sala Montjuïc: certainly the most famous, it takes place around the castle of Montjuïc, the surroundings are simple. The only problem is its popularity; you’ll have to arrive early to get a good seat. The films are projected in their original version, with subtitles. It costs 6€ per session, and 10€ with the tour of the castle. You can bring your own picnic, and rent a deckchair for 3€! My favourite outdoor cinema, free movies on the beach. Who hasn’t dreamed of watching a movie, feet in the sand? 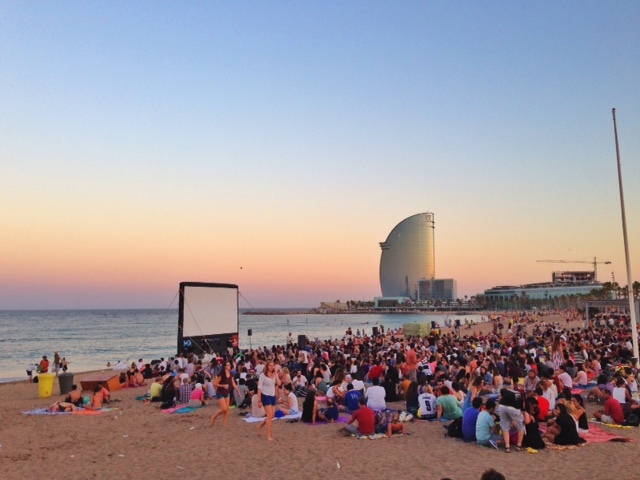 It is now possible, thanks to the festival Cinema lliure a la platja (free cinema at the beach). One of my favourite evening activities in Barcelona. It is one of the oldest bars in the city (open since 1820). Their speciality? Absinthe. This drink, in its original form, is banned in many countries, only a few bars would offer Absinthe on their menu (and most of them are in Spain, obviously!). This drink (which contains 89% alcohol) would be served to you with a glass of water and cane sugar. The bar itself is magnificent, and even if it’s just for a lemonade it’s worth a detour. If the walls of the bar could speak, they would tell you a thousand thrilling stories, some of them concerning artists such as Dali, Picasso or Gaudi. 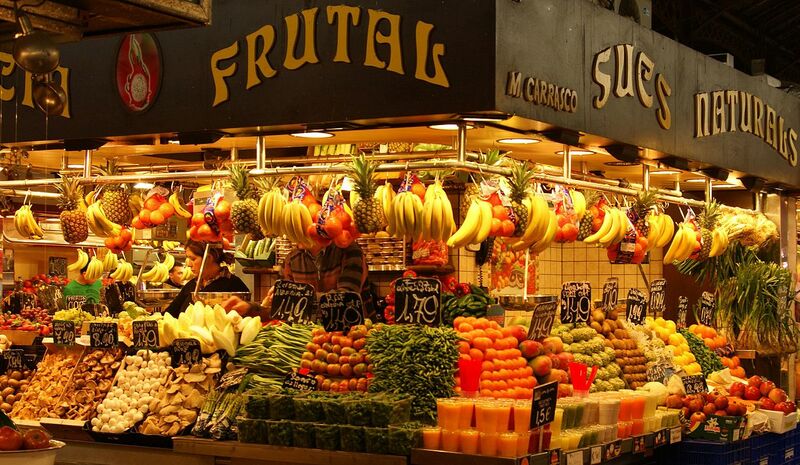 La Boqueria is a must for any visitor of the city, whether you are a fruit fanatic, candy enthusiast, or just curious to take a look! It is a whirlwind of colours, aromas, and people in a frenetic, energising atmosphere. You will immediately be seduced by the incredible array of fresh products. Food market above all, it is also a paradise for gourmets. This lively market is exciting and inspiring! But La Boqueria is not only a market, there are also a few amazing bars in the market. 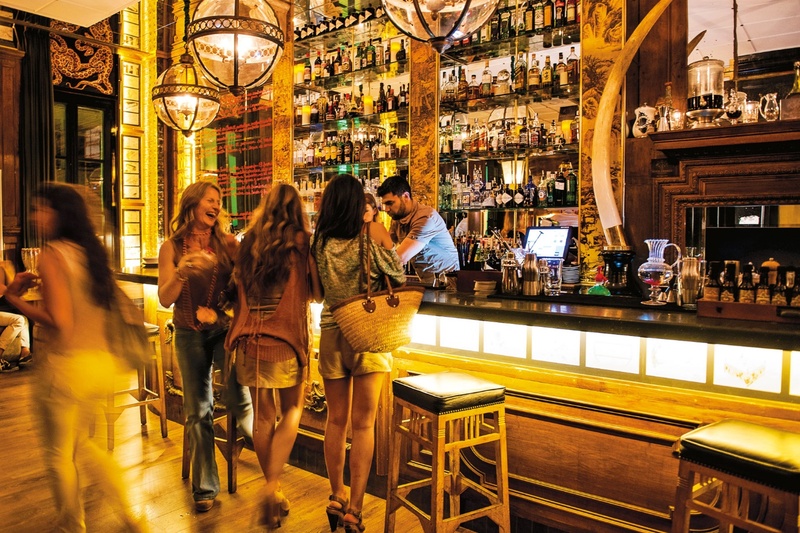 For example, the two tapas bars: Bar Kiosko Moderno, or the locale favourite bar Pinotxo. Not to mention Eslice, where you will be able to choose and taste one of their delicious portions of pizza. The medieval districts of Born and La Ribiera have achieved an almost perfect combination between past and future. Here you can find the latest trends in fashion, mixed with Gothic architecture! Walking in these streets is opening one’s mind to novelty, while being carried away by history, present everywhere. It remains a district of contrasts. Nowadays, the palaces of the Montcada street (former manor houses) are occupied by museums and art rooms, including the Picasso Museum, which contains the youthful work of this artist. This area still attracts many designers who set up in emblematic spaces, bringing together new trends within the medieval ruins and the memory of merchants. Shopping, fashion, bars, noise, silence, history. All this and more is waiting for you in La Ribera: modern and old, workman and chic, contradictions and inconsistencies. Like life itself. 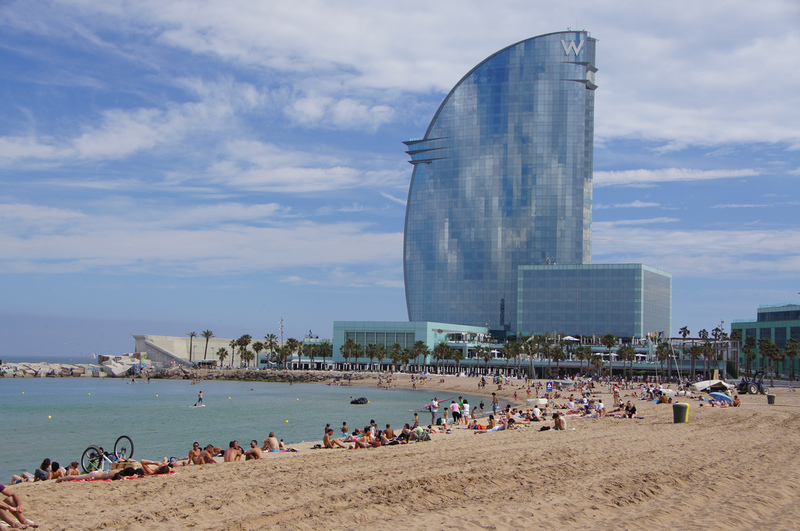 Designed to emulate a sail boat, this ultra-modern skyscraper is naturally one of Barcelona’s most emblematic hotels. It is located right in front of the beach and offers spectacular views of the Mediterranean Sea, the harbour, and the city from its panoramic terrace! The bar of the hotel, the Wet Deck, is the place to be for a drink in the middle of palm trees, overlooking the sea. One can admire one of the most beautiful sunsets in the city! You should definitely try the Pineapple-Ginger Mojito! On Sundays in summer, DJs come to mix; all that in a festive and joyful atmosphere. It is incredibly hard to pick a top five list of things to do in Barcelona, so whilst I invite you to try all of the above and am convinced you will enjoy it, definitely take the time to see some of the landmarks if it’s your first time here!